To cement his place in history as the Astronaut Science President, Trump.com™ has vowed to be the first President to land a man on the moon. Claiming a decommissioned Titan missile was all NASA needed, he announced this world first Moon program to prove to other Axis of Evil Alliance members that he was the greatest Buffoon Clown of all history. He has asked Buzz Aldrin to be the lead astronaut and achieve this before the decade is over. 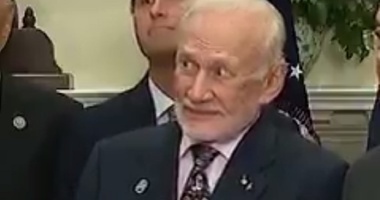 However after his last visit to the Oval Office Aldrin was struck with another severe bout of Traumatic Sphincter Spasm, so he is unsure if will be able to partake in the program. His doctors said any sort of Presidentially induced sudden bowel expulsion would be catastrophic in space. When asked about JFK and the previous moon landings Trump.com™ sneered "JF? who, he was probably a complete loser and the rest that was fake news put out by Clinton because she lost the election". It seems as though the Gemini and the Apollo program history seems to have been consigned to the Orwellian DoubleSpeak bin so that Trump.com™ may claim he was the greatest President of all times. When asked about accepting the mission Aldrin once again repeated his previous comment. "I have already been to the moon, but I have never been to a twilight zone like the Oval Office. But if i get involved it will be a ethnically diverse project, based on merit not conformance to Neo-Nazi propaganda". After Trump.com™ heard this remark he questioned whether Aldrin was white enough for the mission.